A tex-mex style salad with an incredibly creamy Greek yogurt cilantro dressing. Apple Cider & Garlic Vinaigrette - 2 Tbsp. 1) To make the cilantro lime dressing, combine cilantro, Greek yogurt, garlic, lime juice and salt in the bowl of a food processor. With the motor running, add olive oil and vinaigrette in a slow stream until emulsified; set aside. 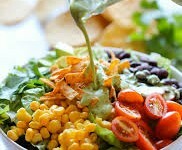 2) To assemble the salad, place romaine lettuce in a large bowl; top with tomatoes, corn, black beans and cilantro. 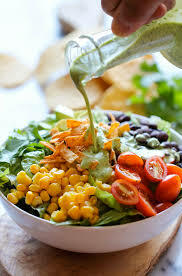 Pour the dressing on top of salad and gently toss to combine. Stir in avocado. 3) Serve immediately, garnish with tortilla strips, if desired.